DSSSB Recruitment 2019 - Below are various recruitment notifications published by DSSSB - Delhi Subordinate Services Selection Board / dsssbonline.nic.in. 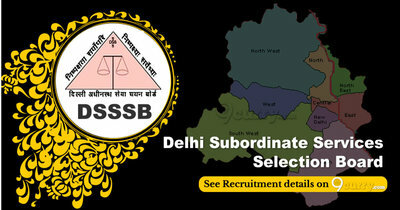 As of now, we don't have any active recruitment notification by DSSSB featured here. We may update as soon as the organization announces a new job notification. If you are looking for any information related to previously organized recruitment drives by DSSSB, you can browse through previous job notifications mentioned below and get the new updates or information you are looking for. DSSSB Recruitment 2018 - Apply Online for 1650 Nursing Officer, Pharmacist & Other Posts in Department of Health & Family Welfare, Delhi. Online Applications are invited by DSSSB - Delhi Subordinate Services Selection Board from 13 Jul 2018 to 13 Aug 2018 for 1650 vacancies. DSSSB Teacher Recruitment 2018 - Apply Online for 9232 Asstt. Teacher, Asstt. Teacher, Physical Edn. Teacher, Drawing Teacher, Domestic Science Teacher, PGT, TGT & Educational and Vocational Guidance Counsellor (EVGC) in New Delhi. Online Applications are invited by DSSSB - Delhi Subordinate Services Selection Board from 5 Jan 2018 to 31 Jan 2018 for 9232 vacancies. DSSSB 835 Grade-II (DASS), Warder, Asstt. & Other Posts Recruitment 2017 - Job notification for 835 Posts of Grade-II (DASS), Warder, Asstt. Superintendent, Matron, Legal Assistant & Pharmacist & Other posts. Online Applications are invited by DSSSB - Delhi Subordinate Services Selection Board from 1 Nov 2017 to 21 Nov 2017 for 835 vacancies. DSSSB Recruitment 2017 - Latest job notification for 15054 PGT, TGT, Primary Teacher, JE, Patwari & Various Other Vacancies in Delhi. Applications are invited by DSSSB - Delhi Subordinate Services Selection Board before 15 Sep 2017 for 15054 vacancies. DSSSB Recruitment 2017 - Latest job notification for 1074 Vacancy of Grade IV DASS, LDC, Statistical Assistant & more for 12th Pass & others in Delhi​. Applications are invited by DSSSB - Delhi Subordinate Services Selection Board before 28 Aug 2017 for 1074 vacancies.